"NFL" redirects here. For other leagues of the same name, see National Football League (disambiguation). For other uses, see NFL (disambiguation). The National Football League (NFL) is a professional American football league consisting of 32 teams, divided equally between the National Football Conference (NFC) and the American Football Conference (AFC). The NFL is one of the four major professional sports leagues in North America, and the highest professional level of American football in the world. The NFL's 17-week regular season runs from early September to late December, with each team playing 16 games and having one bye week. Following the conclusion of the regular season, six teams from each conference (four division winners and two wild card teams) advance to the playoffs, a single-elimination tournament culminating in the Super Bowl, which is usually held in the first Sunday in February, and is played between the champions of the NFC and AFC. The NFL was formed in 1920 as the American Professional Football Association (APFA) before renaming itself the National Football League for the 1922 season. The NFL agreed to merge with the American Football League (AFL) in 1966, and the first Super Bowl was held at the end of that season; the merger was completed in 1970. Today, the NFL has the highest average attendance (67,591) of any professional sports league in the world and is the most popular sports league in the United States. The Super Bowl is among the biggest club sporting events in the world and individual Super Bowl games account for many of the most watched television programs in American history, all occupying the Nielsen's Top 5 tally of the all-time most watched U.S. television broadcasts by 2015. The NFL's executive officer is the commissioner, who has broad authority in governing the league. The players in the league belong to the National Football League Players Association. The team with the most NFL championships is the Green Bay Packers with thirteen (nine NFL titles before the Super Bowl era, and four Super Bowl championships afterwards); the teams with the most Super Bowl championships are the New England Patriots and Pittsburgh Steelers, each with six. The current NFL champions are the New England Patriots, who defeated the Los Angeles Rams in Super Bowl LIII for their sixth Super Bowl championship. On August 20, 1920, a meeting was held by representatives of the Akron Pros, Canton Bulldogs, Cleveland Indians, and Dayton Triangles at the Jordan and Hupmobile auto showroom in Canton, Ohio. This meeting resulted in the formation of the American Professional Football Conference (APFC), a group who, according to the Canton Evening Repository, intended to "raise the standard of professional football in every way possible, to eliminate bidding for players between rival clubs and to secure cooperation in the formation of schedules". Another meeting was held on September 17, 1920 with representatives from teams from four states-Akron, Canton, Cleveland, and Dayton from Ohio; the Hammond Pros and Muncie Flyers from Indiana; the Rochester Jeffersons from New York; and the Rock Island Independents, Decatur Staleys, and Racine (Chicago) Cardinals from Illinois. The league was renamed to the American Professional Football Association (APFA). 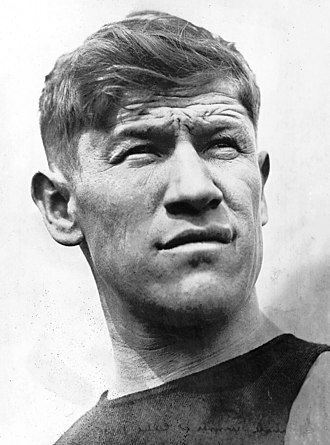 The league elected Jim Thorpe as its first president, and consisted of 14 teams (the Buffalo All-Americans, Chicago Tigers, Columbus Panhandles, and Detroit Heralds joined the league during the year). The Massillon Tigers from Massillon, Ohio was also at the September 17 meeting, but did not field a team in 1920. Only two of these teams, the Decatur Staleys (now the Chicago Bears) and the Chicago Cardinals (now the Arizona Cardinals), remain. Although the league did not maintain official standings for its 1920 inaugural season and teams played schedules that included non-league opponents, the APFA awarded the Akron Pros the championship by virtue of their 8–0–3 (8 wins, 0 losses, and 3 ties) record. The first event occurred on September 26, 1920 when the Rock Island Independents defeated the non-league St. Paul Ideals 48–0 at Douglas Park. On October 3, 1920, the first full week of league play occurred. 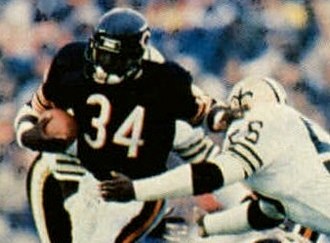 The following season resulted in the Chicago Staleys controversially winning the title over the Buffalo All-Americans. On June 24, 1922, the APFA changed its name to the National Football League (NFL). In 1932, the season ended with the Chicago Bears (6–1–6) and the Portsmouth Spartans (6–1–4) tied for first in the league standings. At the time, teams were ranked on a single table and the team with the highest winning percentage (not including ties, which were not counted towards the standings) at the end of the season was declared the champion; the only tiebreaker was that in the event of a tie, if two teams played twice in a season, the result of the second game determined the title (the source of the 1921 controversy). This method had been used since the league's creation in 1920, but no situation had been encountered where two teams were tied for first. The league quickly determined that a playoff game between Chicago and Portsmouth was needed to decide the league's champion. The teams were originally scheduled to play the playoff game, officially a regular season game that would count towards the regular season standings, at Wrigley Field in Chicago, but a combination of heavy snow and extreme cold forced the game to be moved indoors to Chicago Stadium, which did not have a regulation-size football field. 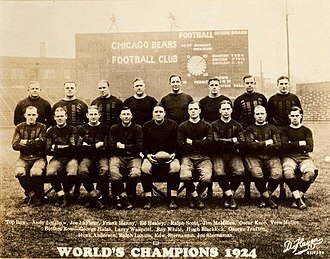 Playing with altered rules to accommodate the smaller playing field, the Bears won the game 9–0 and thus won the championship. Fan interest in the de facto championship game led the NFL, beginning in 1933, to split into two divisions with a championship game to be played between the division champions. The 1934 season also marked the first of 12 seasons in which African Americans were absent from the league. The de facto ban was rescinded in 1946, following public pressure and coinciding with the removal of a similar ban in Major League Baseball. The NFL was always the foremost professional football league in the United States; it nevertheless faced a large number of rival professional leagues through the 1930s and 1940s. Rival leagues included at least three separate American Football Leagues and the All-America Football Conference (AAFC), on top of various regional leagues of varying caliber. Three NFL teams trace their histories to these rival leagues, including the Los Angeles Rams (who came from a 1936 iteration of the American Football League), the Cleveland Browns and San Francisco 49ers (the last two of which came from the AAFC). By the 1950s, the NFL had an effective monopoly on professional football in the United States; its only competition in North America was the professional Canadian football circuit, which formally became the Canadian Football League (CFL) in 1958. With Canadian football being a different football code than the American game, the CFL established a niche market in Canada and still survives as an independent league. A new professional league, the fourth American Football League (AFL), began play in 1960. The upstart AFL began to challenge the established NFL in popularity, gaining lucrative television contracts and engaging in a bidding war with the NFL for free agents and draft picks. The two leagues announced a merger on June 8, 1966, to take full effect in 1970. In the meantime, the leagues would hold a common draft and championship game. The game, the Super Bowl, was held four times before the merger, with the NFL winning Super Bowl I and Super Bowl II, and the AFL winning Super Bowl III and Super Bowl IV. After the league merged, it was reorganized into two conferences: the National Football Conference (NFC), consisting of most of the pre-merger NFL teams, and the American Football Conference (AFC), consisting of all of the AFL teams as well as three pre-merger NFL teams. Today, the NFL is considered[clarification needed] the most popular sports league in North America; much of its growth is attributed to former Commissioner Pete Rozelle, who led the league from 1960 to 1989. Overall annual attendance increased from three million at the beginning of his tenure to seventeen million by the end of his tenure, and 400 million global viewers watched 1989's Super Bowl XXIII. The NFL established NFL Properties in 1963. The league's licensing wing, NFL Properties earns the league billions of dollars annually; Rozelle's tenure also marked the creation of NFL Charities and a national partnership with United Way. Paul Tagliabue was elected as commissioner to succeed Rozelle; his seventeen-year tenure, which ended in 2006, was marked by large increases in television contracts and the addition of four expansion teams, as well as the introduction of league initiatives to increase the number of minorities in league and team management roles. The league's current Commissioner, Roger Goodell, has focused on reducing the number of illegal hits and making the sport safer, mainly through fining or suspending players who break rules. These actions are among many the NFL is taking to reduce concussions and improve player safety. From 1920 to 1934, the NFL did not have a set number of games for teams to play, instead setting a minimum. The league mandated a 12-game regular season for each team beginning in 1935, later shortening this to 11 games in 1937 and 10 games in 1943, mainly due to World War II. After the war ended, the number of games returned to 11 games in 1946 and to 12 in 1947. The NFL went to a 14-game schedule in 1961, which it retained until switching to the current 16-game schedule in 1978. Proposals to increase the regular season to 18 games have been made, but have been rejected in labor negotiations with the National Football League Players Association (NFLPA). 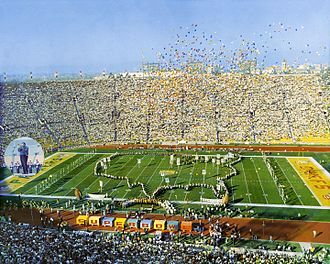 The NFL operated in a two-conference system from 1933 to 1966, where the champions of each conference would meet in the NFL Championship Game. If two teams tied for the conference lead, they would meet in a one-game playoff to determine the conference champion. In 1967, the NFL expanded from 15 teams to 16 teams. Instead of just evening out the conferences by adding the expansion New Orleans Saints to the seven-member Western Conference, the NFL realigned the conferences and split each into two four-team divisions. The four division champions would meet in the NFL playoffs, a two-round playoff. 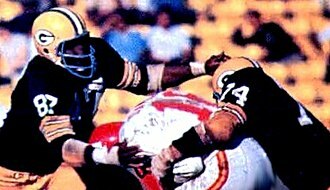 The NFL also operated the Playoff Bowl (officially the Bert Bell Benefit Bowl) from 1960 to 1969. Effectively a third-place game, pitting the two conference runners-up against each other, the league considers Playoff Bowls to have been exhibitions rather than playoff games. The league discontinued the Playoff Bowl in 1970 due to its perception as a game for losers. Following the addition of the former AFL teams into the NFL in 1970, the NFL split into two conferences with three divisions each. The expanded league, now with twenty-six teams, would also feature an expanded eight-team playoff, the participants being the three division champions from each conference as well as one 'wild card' team (the team with the best win percentage) from each conference. In 1978, the league added a second wild card team from each conference, bringing the total number of playoff teams to ten, and a further two wild card teams were added in 1990 to bring the total to twelve. When the NFL expanded to 32 teams in 2002, the league realigned, changing the division structure from three divisions in each conference to four divisions in each conference. As each division champion gets a playoff bid, the number of wild card teams from each conference dropped from three to two. At the corporate level, the National Football League considers itself a trade association made up of and financed by its 32 member teams. Up until 2015, the league was an unincorporated nonprofit 501(c)(6) association. Section 501(c)(6) of the Internal Revenue Code provides an exemption from federal income taxation for "Business leagues, chambers of commerce, real-estate boards, boards of trade, or professional football leagues (whether or not administering a pension fund for football players), not organized for profit and no part of the net earnings of which inures to the benefit of any private shareholder or individual.". In contrast, each individual team (except the non-profit Green Bay Packers) is subject to tax because they make a profit. The NFL gave up the tax exempt status in 2015 following public criticism; in a letter to the club owners, Commissioner Roger Goodell labeled it a "distraction", saying "the effects of the tax exempt status of the league office have been mischaracterized repeatedly in recent years... Every dollar of income generated through television rights fees, licensing agreements, sponsorships, ticket sales, and other means is earned by the 32 clubs and is taxable there. This will remain the case even when the league office and Management Council file returns as taxable entities, and the change in filing status will make no material difference to our business." As a result, the league office might owe around US$10 million in income taxes, but it is no longer required to disclose the salaries of its executive officers. The league has three defined officers: the commissioner, secretary, and treasurer. Each conference has one defined officer, the president, which is essentially an honorary position with few powers and mostly ceremonial duties (such as awarding the conference championship trophy). The commissioner is elected by affirmative vote of two-thirds or 18 (whichever is greater) of the members of the league, while the president of each conference is elected by an affirmative vote of three-fourths or ten of the conference members. The commissioner appoints the secretary and treasurer and has broad authority in disputes between clubs, players, coaches, and employees. He is the "principal executive officer" of the NFL and also has authority in hiring league employees, negotiating television contracts, disciplining individuals that own part or all of an NFL team, clubs, or employed individuals of an NFL club if they have violated league bylaws or committed "conduct detrimental to the welfare of the League or professional football". The commissioner can, in the event of misconduct by a party associated with the league, suspend individuals, hand down a fine of up to US$500,000, cancel contracts with the league, and award or strip teams of draft picks. In extreme cases, the commissioner can offer recommendations to the NFL's Executive Committee up to and including the "cancellation or forfeiture" of a club's franchise or any other action he deems necessary. The commissioner can also issue sanctions up to and including a lifetime ban from the league if an individual connected to the NFL has bet on games or failed to notify the league of conspiracies or plans to bet on or fix games. The current Commissioner of the National Football League is Roger Goodell, who was elected in 2006 after Paul Tagliabue, the previous commissioner, retired. NFL revenue is from three primary sources: NFL Ventures (merchandising), NFL Enterprises (NFL Network and NFL Sunday Ticket, which the league controls), and the television contract. The league distributes such revenue equally among teams, regardless of performance. As of February 2019[update] each team receives $255 million annually from the league's television contract, up 150% from $99.9 million in 2010. Most NFL teams' financial statements are secret. The Kansas City Star obtained the Kansas City Chiefs' tax returns for 2008-2010. According to the Star, the team's revenue rose from $231 million in 2008 to $302 million in 2010. In 2010, two thirds of revenue came from the league: $99.8 million from NFL Ventures ($55.3 million) and NFL Enterprises ($44.6 million), and the $99.9 million share of the television contract. The remaining one third was from tickets ($42.4 million), corporate sponsorships ($6.6 million), food sales ($5 million), parking passes ($4.7 million), in-stadium advertising ($3.7 million), radio contract ($2.7 million), and miscellaneous sources. The largest Chiefs expense in 2010 was $148 million for players, coaches, and other employees. Of the $38 million in operating income, Clark, Lamar Jr., two other children, and widow of former team owner Lamar Hunt divided $17.6 million, and reinvested the remaining $20 million into the team. According to economist Richard D. Wolff, the NFL's revenue model is in contravention of the typical corporate structure. By redistributing profits to all teams the NFL is ensuring that one team will not dominate the league through excessive earnings. Roger Noll described the revenue sharing as the league's "most important structural weakness", however, as there is no disincentive against a team playing badly and the largest cost item, player salaries, is capped. The NFL consists of 32 clubs divided into two conferences of 16 teams in each. Each conference is divided into four divisions of four clubs in each. During the regular season, each team is allowed a maximum of 53 players on its roster; only 46 of these may be active (eligible to play) on game days. Each team can also have a 10-player practice squad separate from its main roster, but the practice squad may only be composed of players who were not active for at least nine games in any of their seasons in the league. A player can only be on a practice squad for a maximum of three seasons. Each NFL club is granted a franchise, the league's authorization for the team to operate in its home city. This franchise covers 'Home Territory' (the 75 miles surrounding the city limits, or, if the team is within 100 miles of another league city, half the distance between the two cities) and 'Home Marketing Area' (Home Territory plus the rest of the state the club operates in, as well as the area the team operates its training camp in for the duration of the camp). Each NFL member has the exclusive right to host professional football games inside its Home Territory and the exclusive right to advertise, promote, and host events in its Home Marketing Area. There are several exceptions to this rule, mostly relating to teams with close proximity to each other: the San Francisco 49ers and Oakland Raiders only have exclusive rights in their cities and share rights outside of it; and teams that operate in the same city (e.g. New York City and Los Angeles) or the same state (e.g. California, Florida, and Texas) share the rights to the city's Home Territory and the state's Home Marketing Area, respectively. Every NFL team is based in the contiguous United States. Although no team is based in a foreign country, the Jacksonville Jaguars began playing one home game a year at Wembley Stadium in London, England, in 2013 as part of the NFL International Series. The Jaguars' agreement with Wembley was originally set to expire in 2016, but has since been extended through 2020. The Buffalo Bills played one home game every season at Rogers Centre in Toronto, Ontario, Canada, as part of the Bills Toronto Series from 2008 to 2013. 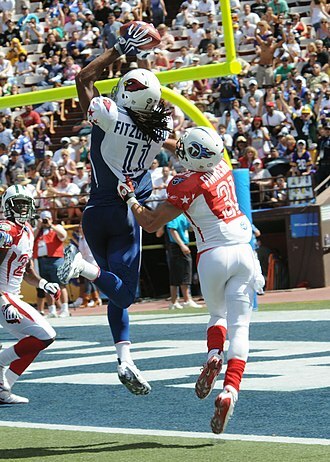 Mexico also hosted an NFL regular-season game, a 2005 game between the San Francisco 49ers and Arizona Cardinals known as "Fútbol Americano", and 39 international preseason games were played from 1986 to 2005 as part of the American Bowl series. The Raiders and Houston Texans played a game in Mexico City at Estadio Azteca on November 21, 2016. According to Forbes, the Dallas Cowboys, at approximately US$4 billion, are the most valuable NFL franchise and the most valuable sports team in the world. Also, all 32 NFL teams rank among the Top 50 most valuable sports teams in the world; and 14 of the NFL's owners are listed on the Forbes 400, the most of any sports league or organization. The 32 teams are organized into eight geographic divisions of four teams each. These divisions are further organized into two conferences, the National Football Conference and the American Football Conference. The two-conference structure has its origins in a time when major American professional football was organized into two independent leagues, the National Football League and its younger rival, the American Football League. The leagues merged in the late 1960s, adopting the older league's name and reorganizing slightly to ensure the same number of teams in both conferences. The NFL season format consists of a four-week preseason, a seventeen-week regular season (each team plays 16 games), and a twelve-team single-elimination playoff culminating in the Super Bowl, the league's championship game. The NFL preseason begins with the Pro Football Hall of Fame Game, played at Fawcett Stadium in Canton. Each NFL team is required to schedule four preseason games, two of which must be at its home stadium, but the teams involved in the Hall of Fame game, as well as any teams playing in an American Bowl game, play five preseason games. Preseason games are exhibition matches and do not count towards regular-season totals. Because the preseason does not count towards standings, teams generally do not focus on winning games; instead, they are used by coaches to evaluate their teams and by players to show their performance, both to their current team and to other teams if they get cut. The quality of preseason games has been criticized by some fans, who dislike having to pay full price for exhibition games, as well as by some players and coaches, who dislike the risk of injury the games have, while others have felt the preseason is a necessary part of the NFL season. Currently, the thirteen opponents each team faces over the 16-game regular season schedule are set using a pre-determined formula: The league runs a seventeen-week, 256-game regular season. Since 2001, the season has begun the week after Labor Day (first Monday in September) and concluded the week after Christmas. The opening game of the season is normally a home game on a Thursday for the league's defending champion. Most NFL games are played on Sundays, with a Monday night game typically held at least once a week and Thursday night games occurring on most weeks as well. NFL games are not normally played on Fridays or Saturdays until late in the regular season, as federal law prohibits professional football leagues from competing with college or high school football. Because high school and college teams typically play games on Friday and Saturday, respectively, the NFL cannot hold games on those days until the third Friday in December. While Saturday games late in the season are common, the league rarely holds Friday games, the most recent one being on Christmas Day in 2009. 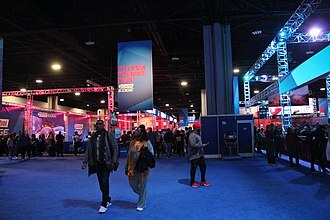 NFL games are rarely scheduled for Tuesday or Wednesday, and those days have only been used twice since 1948: in 2010, when a Sunday game was rescheduled to Tuesday due to a blizzard, and in 2012, when the Kickoff game was moved from Thursday to Wednesday to avoid conflict with the Democratic National Convention. NFL regular season matchups are determined according to a scheduling formula. 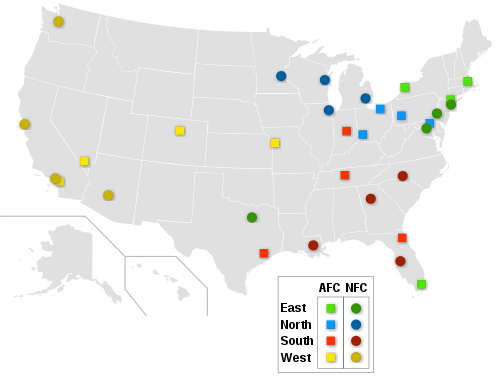 Within a division, all four teams play fourteen out of their sixteen games against common opponents – two games (home and away) are played against the other three teams in the division, while one game is held against all the members of a division from the NFC and a division from the AFC as determined by a rotating cycle (three years for the conference the team is in, and four years in the conference they are not in). The other two games are intraconference games, determined by the standings of the previous year – for example, if a team finishes first in its division, it will play two other first-place teams in its conference, while a team that finishes last would play two other last-place teams in the conference. In total, each team plays sixteen games and has one bye week, where they do not play any games. 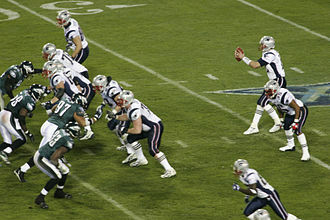 Although a team's home and away opponents are known by the end of the previous year's regular season, the exact dates and times for NFL games are not determined until much later because the league has to account for, among other things, the Major League Baseball postseason and local events that could pose a scheduling conflict with NFL games. During the 2010 season, over 500,000 potential schedules were created by computers, 5,000 of which were considered "playable schedules" and were reviewed by the NFL's scheduling team. After arriving at what they felt was the best schedule out of the group, nearly 50 more potential schedules were developed to try and ensure that the chosen schedule would be the best possible one. Following the conclusion of the regular season, the NFL Playoffs, a twelve-team single elimination tournament, is then held. Six teams are selected from each conference: the winners of each of the four divisions as well as two wild card teams (the two remaining teams with the best overall record). These teams are seeded according to overall record, with the division champions always ranking higher than either of the wild card teams. The top two teams (seeded one and two) from each conference are awarded a bye week, while the remaining four teams (seeded 3–6) from each conference compete in the first round of the playoffs, the Wild Card round, with the third seed competing against the sixth seed and the fourth seed competing against the fifth seed. The winners of the Wild Card round advance to the Divisional Round, which matches the lower seeded team against the first seed and the higher seeded team against the second seed. The winners of those games then compete in the Conference Championships, with the higher remaining seed hosting the lower remaining seed. The AFC and NFC champions then compete in the Super Bowl to determine the league champion. The only other postseason event hosted by the NFL is the Pro Bowl, the league's all-star game. Since 2009, the Pro Bowl has been held the week before the Super Bowl; in previous years, the game was held the week following the Super Bowl, but in an effort to boost ratings, the game was moved to the week before. Because of this, players from the teams participating in the Super Bowl are exempt from participating in the game. The Pro Bowl is not considered as competitive as a regular-season game because the biggest concern of teams is to avoid injuries to the players. The National Football League has used three different trophies to honor its champion over its existence. The first trophy, the Brunswick-Balke Collender Cup, was donated to the NFL (then APFA) in 1920 by the Brunswick-Balke Collender Corporation. The trophy, the appearance of which is only known by its description as a "silver loving cup", was intended to be a traveling trophy and not to become permanent until a team had won at least three titles. The league awarded it to the Akron Pros, champions of the inaugural 1920 season; however, the trophy was discontinued and its current whereabouts are unknown. A second trophy, the Ed Thorp Memorial Trophy, was issued by the NFL from 1934 to 1969. The trophy's namesake, Ed Thorp, was a referee in the league and a friend to many early league owners; upon his death in 1934, the league created the trophy to honor him. In addition to the main trophy, which would be in the possession of the current league champion, the league issued a smaller replica trophy to each champion, who would maintain permanent control over it. The current location of the Ed Thorp Memorial Trophy, long thought to be lost, is believed to be possessed by the Green Bay Packers Hall of Fame. The current trophy of the NFL is the Vince Lombardi Trophy. The Super Bowl trophy was officially renamed in 1970 after Vince Lombardi, who as head coach led the Green Bay Packers to victories in the first two Super Bowls. Unlike the previous trophies, a new Vince Lombardi Trophy is issued to each year's champion, who maintains permanent control of it. Lombardi Trophies are made by Tiffany & Co. out of sterling silver and are worth anywhere from US$25,000 to US$300,000. Additionally, each player on the winning team as well as coaches and personnel are awarded Super Bowl rings to commemorate their victory. The winning team chooses the company that makes the rings; each ring design varies, with the NFL mandating certain ring specifications (which have a degree of room for deviation), in addition to requiring the Super Bowl logo be on at least one side of the ring. The losing team are also awarded rings, which must be no more than half as valuable as the winners' rings, but those are almost never worn. The conference champions receive trophies for their achievement. The champions of the NFC receive the George Halas Trophy, named after Chicago Bears founder George Halas, who is also considered as one of the co-founders of the NFL. The AFC champions receive the Lamar Hunt Trophy, named after Lamar Hunt, the founder of the Kansas City Chiefs and the principal founder of the American Football League. Players on the winning team also receive a conference championship ring. See also: Category:National Football League trophies and awards. The NFL recognizes a number of awards for its players and coaches at its annual NFL Honors presentation. The most prestigious award is the AP Most Valuable Player (MVP) award. Other major awards include the AP Offensive Player of the Year, AP Defensive Player of the Year, AP Comeback Player of the Year, and the AP Offensive and Defensive Rookie of the Year awards. Another prestigious award is the Walter Payton Man of the Year Award, which recognizes a player's off-field work in addition to his on-field performance. The NFL Coach of the Year award is the highest coaching award. The NFL also gives out weekly awards such as the FedEx Air & Ground NFL Players of the Week and the Pepsi MAX NFL Rookie of the Week awards. In the United States, the National Football League has television contracts with four networks: CBS, ESPN, Fox, and NBC. Collectively, these contracts cover every regular season and postseason game. In general, CBS televises afternoon games in which the away team is an AFC team, and Fox carries afternoon games in which the away team belongs to the NFC. These afternoon games are not carried on all affiliates, as multiple games are being played at once; each network affiliate is assigned one game per time slot, according to a complicated set of rules. Since 2011, the league has reserved the right to give Sunday games that, under the contract, would normally air on one network to the other network (known as "flexible scheduling"). The only way to legally watch a regionally televised game not being carried on the local network affiliates is to purchase NFL Sunday Ticket, the league's out-of-market sports package, which is only available to subscribers to the DirecTV satellite service. The league also provides RedZone, an omnibus telecast that cuts to the most relevant plays in each game, live as they happen. In addition to the regional games, the league also has packages of telecasts, mostly in prime time, that are carried nationwide. NBC broadcasts the primetime Sunday Night Football package', which includes the Thursday NFL Kickoff game that starts the regular season and a primetime Thanksgiving Day game. ESPN carries all Monday Night Football games. The NFL's own network, NFL Network, broadcasts a series titled Thursday Night Football, which was originally exclusive to the network, but which in recent years has had several games simulcast on CBS (since 2014) and NBC (since 2016) (except the Thanksgiving and kickoff games, which remain exclusive to NBC). For the 2017 season, the NFL Network will broadcast 18 regular season games under its Thursday Night Football brand, 16 Thursday-evening contests (10 of which are simulcast on either NBC or CBS) as well as one of the NFL International Series games on a Sunday morning and one of the 2017 Christmas afternoon games. In addition, 10 of the Thursday night games will be streamed live on Amazon Prime. In 2017, the NFL games occupied the top three rates for a 30-second advertisement: $699,602 for Sunday Night Football, $550,709 for Thursday Night Football (NBC), and $549,791 for Thursday Night Football (CBS). The Super Bowl television rights are rotated on a three-year basis between CBS, Fox, and NBC. In 2011, all four stations signed new nine-year contracts with the NFL, each running until 2022; CBS, Fox, and NBC are estimated by Forbes to pay a combined total of US$3 billion a year, while ESPN will pay US$1.9 billion a year. The league also has deals with Spanish-language broadcasters NBC Universo, Fox Deportes, and ESPN Deportes, which air Spanish language dubs of their respective English-language sister networks' games. The league's contracts do not cover preseason games, which individual teams are free to sell to local stations directly; a minority of preseason games are distributed among the league's national television partners. Through the 2014 season, the NFL had a blackout policy in which games were 'blacked out' on local television in the home team's area if the home stadium was not sold out. Clubs could elect to set this requirement at only 85%, but they would have to give more ticket revenue to the visiting team; teams could also request a specific exemption from the NFL for the game. The vast majority of NFL games were not blacked out; only 6% of games were blacked out during the 2011 season, and only two games were blacked out in 2013 and none in 2014. The NFL announced in March 2015 that it would suspend its blackout policy for at least the 2015 season. According to Nielsen, the NFL regular season since 2012 was watched by at least 200 million individuals, accounting for 80% of all television households in the United States and 69% of all potential viewers in the United States. NFL regular season games accounted for 31 out of the top 32 most-watched programs in the fall season and an NFL game ranked as the most-watched television show in all 17 weeks of the regular season. At the local level, NFL games were the highest-ranked shows in NFL markets 92% of the time. Super Bowls account for the 22 most-watched programs (based on total audience) in US history, including a record 167 million people that watched Super Bowl XLVIII, the conclusion to the 2013 season. In addition to radio networks run by each NFL team, select NFL games are broadcast nationally by Westwood One (known as Dial Global for the 2012 season). These games are broadcast on over 500 networks, giving all NFL markets access to each primetime game. The NFL's deal with Westwood One was extended in 2012 and will run through 2017. 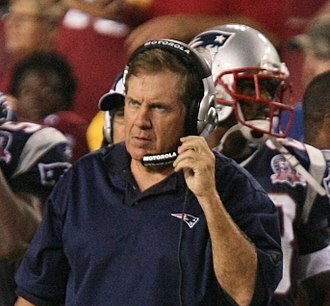 Some broadcasting innovations have either been introduced or popularized during NFL telecasts. 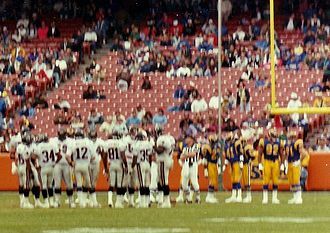 Among them, the Skycam camera system was used for the first time in a live telecast, at a 1984 preseason NFL game in San Diego between the Chargers and 49ers, and televised by CBS. 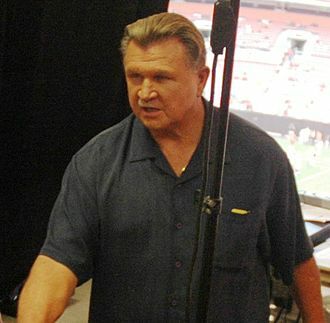 Commentator John Madden famously used a telestrator during games between the early 1980s to the mid-2000s, boosting the device's popularity. The NFL, as a one-time experiment, distributed the October 25, 2015 International Series game from Wembley Stadium in London between the Buffalo Bills and Jacksonville Jaguars. The game was live streamed on the Internet exclusively via Yahoo!, except for over-the-air broadcasts on the local CBS-TV affiliates in the Buffalo and Jacksonville markets. In 2015, the NFL began sponsoring a series of public service announcements to bring attention to domestic abuse and sexual assault in response to what was seen as poor handling of incidents of violence by players. Each April (excluding 2014 when it took place in May), the NFL holds a draft of college players. The draft consists of seven rounds, with each of the 32 clubs getting one pick in each round. The draft order for non-playoff teams is determined by regular-season record; among playoff teams, teams are first ranked by the furthest round of the playoffs they reached, and then are ranked by regular-season record. For example, any team that reached the divisional round will be given a higher pick than any team that reached the conference championships, but will be given a lower pick than any team that did not make the divisional round. The Super Bowl champion always drafts last, and the losing team from the Super Bowl always drafts next-to-last. All potential draftees must be at least three years removed from high school in order to be eligible for the draft. Underclassmen that have met that criterion to be eligible for the draft must write an application to the NFL by January 15 renouncing their remaining college eligibility. Clubs can trade away picks for future draft picks, but cannot trade the rights to players they have selected in previous drafts. Aside from the 32 picks each club gets, compensatory draft picks are given to teams that have lost more compensatory free agents than they have gained. These are spread out from rounds 3 to 7, and a total of 32 are given. Clubs are required to make their selection within a certain period of time, the exact time depending on which round the pick is made in. If they fail to do so on time, the clubs behind them can begin to select their players in order, but they do not lose the pick outright. This happened in the 2003 draft, when the Minnesota Vikings failed to make their selection on time. The Jacksonville Jaguars and Carolina Panthers were able to make their picks before the Vikings were able to use theirs. Selected players are only allowed to negotiate contracts with the team that picked them, but if they choose not to sign they become eligible for the next year's draft. Under the current collective bargaining contract, all contracts to drafted players must be four-year deals with a club option for a fifth. Contracts themselves are limited to a certain amount of money, depending on the exact draft pick the player was selected with. Players who were draft eligible but not picked in the draft are free to sign with any club. The NFL operates several other drafts in addition to the NFL draft. The league holds a supplemental draft annually. Clubs submit emails to the league stating the player they wish to select and the round they will do so, and the team with the highest bid wins the rights to that player. The exact order is determined by a lottery held before the draft, and a successful bid for a player will result in the team forfeiting the rights to its pick in the equivalent round of the next NFL draft. Players are only eligible for the supplemental draft after being granted a petition for special eligibility. The league holds expansion drafts, the most recent happening in 2002 when the Houston Texans began play as an expansion team. Other drafts held by the league include an allocation draft in 1950 to allocate players from several teams that played in the dissolved All-America Football Conference and a supplemental draft in 1984 to give NFL teams the rights to players who had been eligible for the main draft but had not been drafted because they had signed contracts with the United States Football League or Canadian Football League. Like the other major sports leagues in the United States, the NFL maintains protocol for a disaster draft. In the event of a 'near disaster' (less than 15 players killed or disabled) that caused the club to lose a quarterback, they could draft one from a team with at least three quarterbacks. In the event of a 'disaster' (15 or more players killed or disabled) that results in a club's season being canceled, a restocking draft would be held. Neither of these protocols has ever had to be implemented. Free agents in the National Football League are divided into restricted free agents, who have three accrued seasons and whose current contract has expired, and unrestricted free agents, who have four or more accrued seasons and whose contract has expired. An accrued season is defined as "six or more regular-season games on a club's active/inactive, reserved/injured or reserve/physically unable to perform lists". Restricted free agents are allowed to negotiate with other clubs besides their former club, but the former club has the right to match any offer. If they choose not to, they are compensated with draft picks. Unrestricted free agents are free to sign with any club, and no compensation is owed if they sign with a different club. Clubs are given one franchise tag to offer to any unrestricted free agent. The franchise tag is a one-year deal that pays the player 120% of his previous contract or no less than the average of the five highest-paid players at his position, whichever is greater. There are two types of franchise tags: exclusive tags, which do not allow the player to negotiate with other clubs, and non-exclusive tags, which allow the player to negotiate with other clubs but gives his former club the right to match any offer and two first-round draft picks if they decline to match it. Clubs also have the option to use a transition tag, which is similar to the non-exclusive franchise tag but offers no compensation if the former club refuses to match the offer. Due to that stipulation, the transition tag is rarely used, even with the removal of the "poison pill" strategy (offering a contract with stipulations that the former club would be unable to match) that essentially ended the usage of the tag league-wide. Each club is subject to a salary cap, which is set at US$143.28 million for the 2015 season, US$10 million more than in 2014 and US$20 million more than in 2013. The salary cap for the 2016 NFL season was $155.27 million. The salary cap for the 2017 NFL season was about $167 million. Members of clubs' practice squads, despite being paid by and working for their respective clubs, are also simultaneously a kind of free agent and are able to sign to any other club's active roster (provided their new club is not their previous club's next opponent within a set number of days) without compensation to their previous club; practice squad players cannot be signed to other clubs' practice squads, however, unless released by their original club first. ^ All teams are based in the United States, but several preseason and regular season games have been held internationally. ^ a b The New York Jets and New York Giants share MetLife Stadium. ^ a b The Baltimore Ravens were originally the Cleveland Browns, and moved to Baltimore in 1996. Due to an agreement with the city of Cleveland that allowed the club to move, the Browns name, colors, and team history/records were left for a new Cleveland Browns team while the team, personnel, and staff of the old Browns team were allowed to move to Baltimore. As such, the Ravens are considered to have begun play in 1996 while the current Cleveland Browns are considered to have been founded in 1950, became inactive from 1996 to 1998, and resumed play as new team in 1999. ^ The Jaguars began playing one home game each season at Wembley Stadium in London, England in 2013, and will continue to do so through 2020. 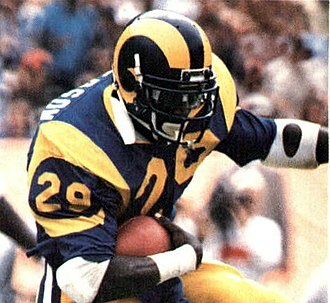 ^ a b The Los Angeles Rams will play at Los Angeles Memorial Coliseum from 2016 to 2019 and the Los Angeles Chargers will play at Dignity Health Sports Park from 2017 to 2019 until the Los Angeles Stadium at Hollywood Park in Inglewood, California, has finished construction for the 2020 NFL season. ^ "Chronology of Professional Football" (PDF). 2018 Official National Football League Record and Fact Book. NFL Enterprises, LLC. August 9, 2018. Retrieved December 31, 2018. An organizational meeting, at which the Akron Pros, Canton Bulldogs, Cleveland Indians, and Dayton Triangles were represented, was held at the Jordan and Hupmobile auto showroom in Canton, Ohio, August 20. This meeting resulted in the formation of the American Professional Football Conference. ^ "History: NFL Champions". Pro Football Hall of Fame. Retrieved January 30, 2013. ^ "NFL is world's best attended pro sports league". ABS-CBN News. Agence France-Presse. January 6, 2013. Retrieved January 30, 2013. ^ "Pro Football is Still America's Favorite Sport". Harris Interactive. January 26, 2016. Archived from the original on January 29, 2016. Retrieved June 11, 2016. ^ Harris, Nick (January 31, 2010). "Elite clubs on Uefa gravy train as Super Bowl knocked off perch". The Independent. London. Retrieved November 28, 2012. ^ "Super Bowl XLV Most Viewed Telecast in U.S. Broadcast History". Nielsen Company. February 7, 2011. Retrieved February 17, 2013. ^ a b "NFL founded in Canton - Pro Football Hall of Fame Official Site". www.profootballhof.com. ^ a b "Happy Birthday NFL?" (PDF). The Coffin Corner. Professional Football Researchers Association. 2 (8). 1980. Archived from the original (PDF) on February 6, 2009. Retrieved February 7, 2013. ^ "National Football League (NFL)". Encyclopædia Britannica. Retrieved June 21, 2013. ^ "Past Standings" (PDF). National Football League. p. 27. Retrieved February 21, 2019. ^ "St. Paul Ideals at Rock Island Independents - September 26th, 1920 - Pro-Football-Reference.com". Pro-Football-Reference.com. ^ "1920 APFA Standings & Team Stats - Pro-Football-Reference.com". Pro-Football-Reference.com. ^ "1920 Rock Island Independents Schedule & Game Results - Pro-Football-Reference.com". Pro-Football-Reference.com. ^ "1922 American Professional Football Association changes name to National Football League". Pro Football Hall of Fame. Retrieved June 29, 2017. ^ "Past Standings" (PDF). National Football League. p. 26. Retrieved February 21, 2019. ^ Carroll, Bob. "The 60-Yard Circus" (PDF). Professional Football Researchers Association. Archived from the original (PDF) on September 29, 2010. Retrieved February 9, 2013. ^ Finkelman, Paul, ed. 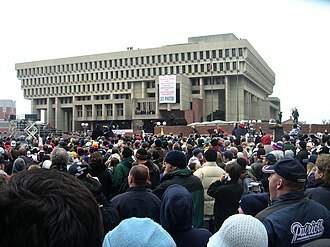 (February 2, 2009). Encyclopedia of African American History, 1896 to the Present: From the Age of Segregation to the Twenty-first Century. 1. Oxford University Press. 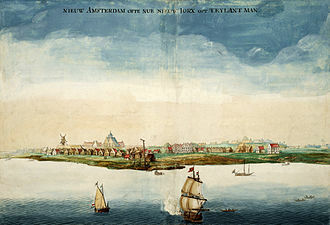 p. 235. ISBN 978-0195167795. Retrieved June 21, 2013. ^ Cross, B. Duane (January 22, 2001). "Off-the-field competition yields game-changing merger". CNNSI. Archived from the original on February 15, 2001. Retrieved February 15, 2013. ^ a b "History: 1961–1970". NFL.com. NFL Enterprises, LLC. Retrieved February 14, 2013. ^ a b Bartlett, Roger; Gratton, Chris; Rolf, Christer, eds. (October 26, 2009). Encyclopedia of International Sports Studies. Routledge. pp. 932–933. ISBN 978-0415561471. Retrieved June 21, 2013. ^ Evans, Thayer (February 2, 2008). "The Legacy of Tagliabue?". The New York Times. Retrieved June 27, 2013. ^ Lapchick, Richard (August 17, 2006). "Report Card: Tagliabue's legacy includes new model for racial hiring". ESPN.com. Retrieved June 27, 2013. ^ Taylor, Jean-Jacques. "Roger Goodell's authority takes a hit". ESPN.com. Retrieved December 13, 2012. ^ Brady, Erik; Gary Mihoces (September 16, 2013). "Violent hits keep coming, so is NFL changing culture?". USA Today. Retrieved September 22, 2013. ^ "NFL Regular Season Games Played per Season". Pro Football Hall of Fame. Retrieved February 13, 2013. ^ a b c Maske, Mark (August 29, 2013). "NFL preseason is long and often meaningless but a solution isn't apparent to league, players". The Washington Post. Archived from the original on September 1, 2013. Retrieved August 28, 2013. ^ "Lady Luck and the Lombardi legend". Cold Hard Football Facts. Football Nation. October 12, 2005. Archived from the original on May 13, 2013. Retrieved February 14, 2013. ^ King, Steve (January 7, 2013). "This Day in Browns History – Jan. 7". ClevelandBrowns.com. NFL Enterprises, LLC. Archived from the original on January 11, 2013. Retrieved December 31, 2018. ^ "History of the Wild Card". Pro Football Hall of Fame. Retrieved February 14, 2013. ^ Wilson, Doug (August 11, 2008). "N.F.L. Executives Hope to Keep Salaries Secret". The New York Times. Retrieved February 2, 2013. ^ Schrotenboer, Brent (May 30, 2013). "To tax or not? The NFL's relationship with the IRS". USA Today. Retrieved January 30, 2013. ^ "Community: Shareholders". Packers.com. NFL Enterprises, LLC. Retrieved December 31, 2018. Green Bay Packers Inc., has been a publicly owned, nonprofit corporation since Aug. 18, 1923, when original articles of incorporation were filed with Wisconsin's secretary of state. ^ "NFL targeted by Oklahoma senator for 'not-for-profit' tax status". Sports Illustrated. March 5, 2012. Archived from the original on November 27, 2012. Retrieved February 2, 2013. ^ Myers, Gary (April 18, 2015). "NFL no longer non-profit after giving up tax exempt status". New York Daily News. Retrieved June 25, 2015. ^ NFL Bylaws, p. 26–27. ^ a b c d e NFL Bylaws, p. 28–35. ^ Maske, Mark (August 9, 2006). "Owners Pick Goodell as NFL Commissioner". The Washington Post. Retrieved February 2, 2013. ^ a b c d Hendricks, Mike; Vockrodt, Steve (2019-02-06). "Kansas City Chiefs' tax returns provide rare look inside the business of pro football". The Kansas City Star. Retrieved 2019-02-10. ^ "Economic Update: Women's Movement Economics". ^ Florio, Mike (April 23, 2012). "League unexpectedly expands rosters from 80 to 90". Pro Football Talk. NBC Sports. Retrieved February 1, 2013. ^ Smith, Michael David (July 22, 2011). "NFL drops third quarterback rule, 46 active players on game day". NBC Sports. Retrieved February 1, 2013. ^ "Practice squads for all 32 NFL teams: Case Keenum joins Texans". NFL.com. NFL Enterprises, LLC. September 1, 2012. Retrieved February 1, 2013. ^ "Article IV–Territorial Rights" (PDF). Constitution and By-Laws of the National Football League. NFL Enterprises, LLC. February 1, 1970. Retrieved December 31, 2018. ^ a b Pengelly, Martin (August 21, 2012). "Jacksonville Jaguars to play four NFL 'home' games at Wembley". The Guardian. London. Retrieved February 1, 2013. ^ a b "NFL, Jaguars extend agreement to play at Wembley through 2020". NFL.com (Press release). NFL Enterprises, LLC. October 22, 2015. Retrieved November 24, 2016. ^ "History to be made in Mexico City". NFL.com. NFL Enterprises, LLC. September 28, 2005. Archived from the original on June 25, 2006. Retrieved February 1, 2013. ^ Chadiha, Jeffri (October 24, 2007). "Foreign objective: London game critical for NFL's global aspirations". ESPN.com. Retrieved February 1, 2013. ^ "Back to Mexico: Texans-Raiders to play Nov. 21 in Mexico City". NFL.com. NFL Enterprises, LLC. Retrieved February 6, 2016. ^ Ozanian, Mike (September 14, 2015). "The NFL's Most Valuable Teams". Forbes. Retrieved September 15, 2015. ^ Badenhausen, Kurt (April 18, 2012). "Manchester United Tops The World's 50 Most Valuable Sports Teams". Forbes. Retrieved September 12, 2012. ^ Rovell, Darren (September 16, 2013). "Sports owners highlight U.S. 'Richest'". ESPN.com. ESPN. Retrieved February 8, 2018. ^ a b "Teams". Pro Football Hall of Fame. Retrieved February 1, 2013. ^ Breer, Albert (July 6, 2012). "NFL stadiums go from boom to swoon in span of a decade". NFL.com. NFL Enterprises, LLC. Retrieved February 1, 2013. ^ a b "History of NFL franchises, 1920–present". Pro Football Hall of Fame. Retrieved February 1, 2013. ^ Borden, Sam; Shipigel, Ben (December 22, 2011). "Preparations Different for a Home-and-Home Contest". The New York Times. Retrieved February 2, 2013. ^ Morgan, Jan (February 9, 1996). "Deal clears NFL path to Baltimore". The Baltimore Sun. Retrieved February 1, 2013. ^ Gossi, Tony (September 12, 1999). "Rival Pittsburgh gives Cleveland a brutal welcome in 43–0 drubbing". The Plain Dealer. Archived from the original on May 13, 2013. Retrieved February 1, 2013. ^ "Jacksonville Jaguars to host regular-season game in United Kingdom in each of next four years". Jaguars.com. NFL Enterprises, LLC. August 21, 2012. Archived from the original on September 19, 2015. Retrieved December 31, 2018. ^ Hanzus, Dan (January 12, 2016). "Rams to relocate to L.A.; Chargers first option to join". NFL.com. NFL Enterprises, LLC. Retrieved January 18, 2016. ^ "General FAQs". WelcomeHomeRams.com. NFL Enterprises, LLC. January 18, 2016. Archived from the original on January 17, 2016. Retrieved December 31, 2018. Where will the Rams play? For the first three seasons we'll play at the L.A. Coliseum. In 2020, we'll move into the most advanced, world-class stadium ever built located in Inglewood, CA. ^ "Chargers to Relocate to Los Angeles". Chargers.com. NFL Enterprises, LLC. January 12, 2017. Archived from the original on April 28, 2017. Retrieved December 31, 2018. Capacity for Chargers games at StubHub Center will be 30,000 seats, with approximately 3,000 premium and field seats, 46 suites, 16 cabanas, and 10,000 on-site parking spaces. ^ "NFL/Hall of Fame Game". Pro Football Hall of Fame. Retrieved February 4, 2013. ^ NFL Bylaws, p. 114. ^ Bowen, Matt (August 29, 2012). "Exhibition finale biggest game of year for players on bubble". The Chicago Tribune. Retrieved February 4, 2013. ^ a b Smith, Michael David Smith (August 14, 2013). "Jim Irsay to fans: You don't really pay full price for preseason tickets". Pro Football Talk. NBC Sports. Retrieved September 18, 2013. ^ Issacson, Melissa (December 25, 2005). "Ghost of Christmas past: Sports-free TV". The Chicago Tribune. Retrieved February 6, 2013. ^ a b "2012 NFL Schedule Announced". NFL Communications. April 17, 2012. Archived from the original on November 1, 2012. Retrieved February 4, 2013. ^ Sensei, Andrew. "Sports Law". Tulane University Law School. Archived from the original on September 25, 2013. Retrieved February 23, 2019. ^ "Blizzard forces postponement of Vikes-Eagles game to Tuesday". NFL.com. NFL Enterprises, LLC. December 26, 2010. Retrieved February 4, 2013. ^ "NFL season opener to be held Wednesday, Sept. 5". NFL.com. NFL Enterprises, LLC. February 28, 2012. Retrieved February 4, 2013. ^ "Realignment for 2002". NFL.com. NFL Enterprises, LLC. Retrieved February 4, 2013. ^ Florio, Mike (November 8, 2011). "Unusual bye format traces to lockout". Pro Football Talk. NBC Sports. Retrieved February 4, 2013. ^ Ourand, John (April 26, 2010). "NFL schedule navigated World Series, other conflicts". Sports Business Daily. Archived from the original on August 13, 2011. Retrieved February 4, 2013. ^ "Tie-breaking procedures". NFL.com. NFL Enterprises, LLC. Retrieved February 4, 2013. ^ "Pro Bowl set for Jan. 27 in Honolulu, week before Super Bowl". NFL.com. NFL Enterprises, LLC. May 30, 2012. Retrieved February 4, 2013. ^ "NFC reels in five picks to throttle AFC in Pro Bowl". ESPN.com. ESPN Internet Ventures, LLC. January 30, 2011. Retrieved January 16, 2017. ^ Price, Mark J. (April 25, 2011). "Local history: Searching for lost trophy". Akron Beacon Journal. Retrieved February 5, 2013. ^ Terl, Matt (July 28, 2008). "Inside Redskins Park: The Other Championship Trophy". Official Redskins Blog. Retrieved February 5, 2013. ^ Christi, Cliff (January 28, 2017). "The mystery of the Ed Thorp Memorial Trophy". Packers.com. NFL Enterprises, LLC. Archived from the original on January 28, 2017. Retrieved December 31, 2018. ^ Horovitz, Bruce (January 30, 2002). "Football's super prize reaches icon status". USA Today. Retrieved February 5, 2013. ^ "45 Years of Super Bowl Rings". ESPN.com. Retrieved February 5, 2013. ^ Neel, Eric. "Super Bowl from A to Z". ESPN.com. Retrieved June 8, 2013. ^ Jensen, Sean. "NFC's Halas trophy has new look". Chicago Sun-Times. Retrieved February 5, 2013. ^ Tafur, Vic (January 26, 2013). "O.J. 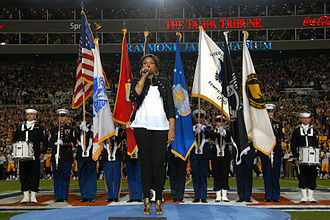 Brigance inspires Ravens". San Francisco Chronicle. Retrieved February 5, 2013. ^ Pollak, Austin (June 14, 2012). "Patriots Receive AFC Championship Rings From Owner Robert Kraft". New England Sports Network. Retrieved February 5, 2013. ^ "Seahawks receive NFC championship rings". ESPN.com. June 7, 2006. Retrieved February 5, 2013. ^ Klis, Mike (February 2, 2013). "MVP in NFL: Peyton Manning or Adrian Peterson, it's a two-horse race". The Denver Post. Retrieved February 16, 2013. ^ "NFL Honors". NFL.com. NFL Enterprises, LLC. Retrieved February 16, 2013. ^ Watkins, Calvin (February 2, 2013). "Jason Witten wins Walter Payton NFL Man of the Year award". ESPN.com. ESPN Internet Ventures, LLC. Retrieved February 16, 2013. ^ Brinson, Will (February 2, 2013). "Bruce Arians wins 2012 Coach of the Year Award". CBS Sports. Retrieved February 16, 2013. ^ "Peyton Manning and Adrian Peterson named 2012 FedEx Air & Ground NFL Players of the Year at '2nd Annual NFL Honors'". NFL.com. NFL Enterprises, LLC. Retrieved February 17, 2013. ^ "Seattle Seahawks QB Russell Wilson named 2012 Pepsi MAX NFL Rookie of the Year". NFL.com. NFL Enterprises, LLC. Retrieved February 17, 2013. ^ a b c "The tradition continues: NFL to remain on broadcast TV". NFL.com. NFL Enterprises, LLC. December 14, 2011. Retrieved February 5, 2013. ^ Florio, Mike (December 1, 2011). "Flexible schedule flexes Broncos-Vikings from CBS to FOX". Pro Football Talk. NBC Sports. Retrieved February 5, 2013. ^ Fixmer, Andy (November 29, 2012). "Thursday Night Football Scores Big for the NFL". Bloomberg Businessweek. Retrieved February 5, 2013. ^ Sun, Leo (October 31, 2017). "NFL games still command high ad prices". Florida Today. New York City. pp. 3B. Retrieved October 31, 2017. ^ Badenhausen, Kurt (December 14, 2011). "The NFL Signs TV Deals Worth $27 Billion". Forbes. Retrieved February 6, 2013. ^ Molloy, Tim (August 30, 2011). "Telemundo Extends Deal With NFL Through 2013". Reuters. Retrieved February 6, 2013. ^ Kirkendall, Josh (September 8, 2011). "NFL And ESPN Reach Major Media Rights Deal". Cincy Jungle. SB Nation. Retrieved February 6, 2013. ^ "NFL eases local TV blackout restrictions for upcoming season". NFL.com. NFL Enterprises, LLC. June 30, 2012. Retrieved February 6, 2013. ^ a b "NFL to suspend TV blackout policy". ESPN.com. March 24, 2015. Retrieved March 24, 2015. 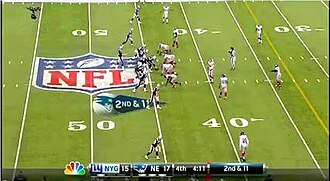 ^ "NFL 2012 TV Recap". NFL Communications. January 3, 2003. Archived from the original on January 29, 2013. Retrieved February 6, 2013. ^ Bibel, Sara (February 4, 2014). "Sunday Final Ratings: 'New Girl' & 'Brooklyn Nine Nine' Adjusted Up & Final Super Bowl Numbers (Updated)". Zap2it. Retrieved February 11, 2014. ^ "NFL and Dial Global Agree on New Multi-Year Extension". Dial Global. September 19, 2012. Archived from the original on April 25, 2013. Retrieved February 6, 2013. ^ Cone, Lawrence L. (October 1985). "Skycam: An Aerial Robotic Camera System". BYTE. p. 122. Retrieved April 2, 2016. ^ "NFL and Yahoo! partner to deliver first-ever global live stream". NFL.com (Press release). NFL Enterprises, LLC. June 3, 2015. Retrieved July 24, 2015. ^ Schwab, Frank (June 3, 2015). "Yahoo will broadcast first free global live stream of NFL game". Yahoo! Sports. Retrieved July 24, 2015. ^ Clark, Kevin (March 23, 2015). "NFL to Broadcast a Game Nationally Via Internet Only". The Wall Street Journal. Retrieved March 24, 2015. ^ Maggie Penman (January 14, 2015). "Ads Say 'No More' To Domestic Violence, But Will Audience Listen?". NPR. Retrieved June 26, 2015. ^ a b Love, Tim (April 23, 2009). "What's the NFL draft all about?". BBC Sport. Retrieved February 11, 2013. ^ "Complete order of first round of 2011 NFL Draft determined". NFL.com. NFL Enterprises, LLC. March 27, 2012. Retrieved February 11, 2013. ^ Smith, Michael David (January 1, 2013). "NFL draft rules a bad deal for Jadeveon Clowney". Pro Football Talk. NBC Sports. Retrieved February 11, 2013. ^ "NFL officially grants draft eligibility to 65 underclassmen". NFL.com. NFL Enterprises, LLC. January 19, 2012. Retrieved February 11, 2013. ^ Schrager, Peter (March 31, 2011). "Addressing NFL draft trade rules, times". Fox Sports. Retrieved February 11, 2013. ^ Aiello, Greg; McCarthy, Brian; Signora, Michael (March 26, 2012). "NFL Announces 32 Compensatory Draft Choices to 15 Clubs" (PDF). NFL Labor. Retrieved February 11, 2013. ^ Black, James C. (May 29, 2003). "Offseason overview: Minnesota Vikings". ESPN.com. Retrieved February 11, 2013. ^ Flatter, Ron (March 9, 2006). "Bo knows stardom and disappointment". ESPN.com. Archived from the original on January 20, 2013. Retrieved February 11, 2013. ^ Badenhausen, Kurt (April 24, 2012). "NFL Draft Picks More Valuable Than Ever Under New System". Forbes. Retrieved February 11, 2013. ^ Jeremiah, Daniel (July 11, 2012). "Supplemental draft primer: Josh Gordon has NFL teams buzzing". NFL.com. NFL Enterprises, LLC. Retrieved February 11, 2013. ^ Schefter, Adam (August 15, 2011). "Terrelle Pryor remains in draft limbo". ESPN.com. Retrieved February 11, 2013. ^ "Building Block". ESPN.com. February 12, 2002. Retrieved February 11, 2013. ^ "Allocation Draft" (PDF). Professional Football Researchers Association. Archived from the original (PDF) on May 5, 2012. Retrieved February 11, 2013. ^ "1984 Supplemental Draft". Pro Football Hall of Fame. Retrieved February 11, 2013. ^ Drehs, Wayne (April 10, 2001). "'God forbid it should ever be needed'". ESPN.com. Retrieved February 11, 2013. ^ a b "Questions and answers for 2012 free agency". NFL.com. NFL Enterprises, LLC. March 11, 2012. Retrieved February 16, 2013. ^ Reynolds, Neil (February 16, 2012). "NFL Explained: The Franchise Tag". NFLUK. Archived from the original on February 18, 2012. Retrieved February 16, 2013. ^ Nogle, Kevin (December 28, 2012). "NFL Franchise Tags and the Miami Dolphins". ThePhinsider.com. SB Nation. Retrieved February 16, 2013. ^ Breer, Albert (February 23, 2012). "New wrinkles to franchise tag, salary cap happened for reason". NFL.com. NFL Enterprises, LLC. Retrieved February 16, 2013. ^ Myers, Keith (February 16, 2008). "The Poison Pill is dead". 12th Man Rising. SI.com. Retrieved February 16, 2013. ^ Patra, Kevin (March 2, 2015). "NFL salary cap will be $143.28 million in 2015". NFL.com. NFL Enterprises, LLC. Retrieved June 25, 2015. ^ Knoblauch, Austin (February 26, 2016). "NFL salary cap set at $155.27 million for 2016". NFL.com. NFL Enterprises, LLC. Retrieved June 13, 2017. ^ Around the NFL staff (March 1, 2017). "NFL salary cap for 2017 season set at $167 million". NFL.com. NFL Enterprises, LLC. Retrieved June 13, 2017. ^ Chassen, Alexis (September 6, 2015). "Everything you need to know about NFL practice squads". SB Nation. Retrieved January 16, 2017. "Constitution and Bylaws of the National Football League" (PDF). 2006. Archived (PDF) from the original on March 26, 2014. Retrieved February 2, 2013.
Zimmer, John; Marini, Matt, eds. (2013). Official 2013 National Football League Record & Fact Book (PDF). 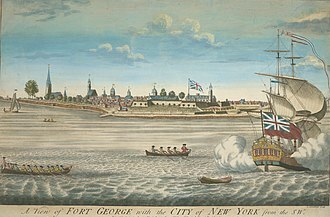 New York: National Football League. ISBN 978-1-603-20980-9. Archived from the original (PDF) on October 11, 2013. Retrieved October 11, 2013. "2013 Official Playing Rules of the National Football League" (PDF). National Football League. 2013. Archived (PDF) from the original on March 26, 2014. Retrieved March 26, 2014. "2011–20 NFL/NFLPA Collective Bargaining Agreement" (PDF). National Football League. August 4, 2011. Archived (PDF) from the original on March 26, 2014. Retrieved March 26, 2014. 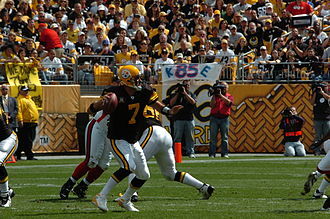 Wikimedia Commons has media related to National Football League. 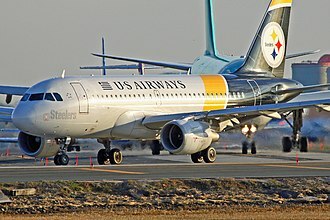 Wikivoyage has a travel guide for American Football. The professional American football team now known as the Detroit Lions previously played in Portsmouth, Ohio from its founding in 1929 to its relocation to Detroit in 1934. 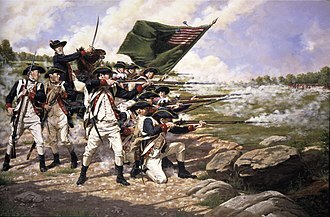 This article chronicles the history during their time as the Portsmouth Spartans. Originally drawing players from defunct independent professional and semi-pro teams, they joined the fledgling National Football League in 1930 and their home stadium was Universal Stadium. The Spartans formed in 1929, drawing players from defunct independent professional, during that same year, Portsmouth residents agreed to fund the construction of a football stadium that was comparable to those in neighboring communities along the Ohio River. That approval prompted the National Football League to offer the city a franchise in July 1930, and led to the construction of Universal Stadium, which opened September 14 with a capacity of 8,200. With less than 43,000 residents in 1930, Portsmouth became the NFLs second smallest city, ahead of only Green Bay, in that game, Spartan coach Potsy Clark refused to make even a single substitution against the defending NFL champion Packers. Roger Stokoe Goodell is an American businessman who is currently the Commissioner of the National Football League. Goodell was chosen to succeed the retiring Paul Tagliabue on August 8,2006 and he was chosen over four finalists for the position, winning a close vote on the fifth ballot before being unanimously approved by acclamation of the owners. He officially began his tenure on September 1,2006, just prior to the beginning of the 2006 NFL season, commentators have described him as the most powerful man in sports. 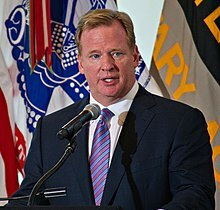 Goodell was born in Jamestown, New York on February 19,1959, to United States Senator Charles Ellsworth Goodell of New York, and Jean Goodell of Buffalo, New York. He graduated from Bronxville High School where, as a star in football, basketball. Injuries kept him from playing college football, Goodell is a 1981 graduate of Washington & Jefferson College in Washington, Pennsylvania with a degree in economics. In 1983, he joined the New York Jets as an intern, as the NFLs COO, Goodell took responsibility for the leagues football operations and officiating, as well as supervised league business functions. He headed NFL Ventures, which oversees the business units, including media properties and sales, stadium development. Goodell was heavily involved in the negotiation of the collective bargaining agreement with the NFLPA and he played an extensive role in league expansion and stadium development, including the launch of the NFL Network and securing new television agreements. Upon Tagliabues retirement Goodell was one of the candidates in contention for the role, in the second and third ballots and Gregg Levy were the only candidates to receive votes. The Oakland Raiders abstained from the voting in each round, Goodell was chosen on August 8,2006 to succeed Tagliabue and assumed office on September 1, the date Tagliabue had set to step down. Goodell believes his primary responsibility as commissioner is protecting the integrity of the game and making it safer—protecting the shield, some of his actions in this regard have been met with criticism. The spring league NFL Europe, founded in 1995 and since 2004 with five of six teams based in Germany, was shut down by Goodell after the 2007 season, the NFL International Series began in October 2007 with regular season games in London. Hupmobile was an automobile built from 1909 through 1939 by the Hupp Motor Car Company. The prototype was developed in 1908 and had its first successful run on November 8 with investors aboard for champagne at the Tuller Hotel a few blocks away, the company was incorporated in November of that year. The first Hupmobile model, the Hupp 20, was introduced at the 1909 Detroit automobile show, robert Craig Hupp, a former employee of Oldsmobile and Ford, founded the company with investors J. Walter Drake, Joseph Drake, John Baker and Edwin Denby. J. Walter Drake was elected president and Bobby Hupp as vice president, emil Nelson, formerly of Oldsmobile and Packard, joined the company as chief engineer, Charles Hastings, formerly of Oldsmobile, joined as assistant general manager. In late 1909 Bobbys brother Louis Gorham Hupp left his job with the Michigan Central Railroad in Grand Rapids, Hupp Motors obtained sufficient cash deposits at the 1909 automobile show to begin manufacturing the Hupp 20. The first cars were built in a building at 345 Bellevue Avenue in Detroit. The company immediately outgrew this space and began construction of a factory a few blocks away at E. Jefferson Avenue and Concord, the company produced 500 vehicles by the end of the 1909 model year. Production increased to more than 5,000 in the 1910 model year, henry Ford paid the Hupp 20 the ultimate compliment. I recall looking at Bobby Hupps roadster at the first show where it was exhibited, Hupps expansive business plans did not sit well with his investors and in August 1911, they bought him out. Bobby Hupp immediately brought out the RCH motor car and he combined all of his business enterprises into Hupp Corporation. Hupp Motors was successful in the suit and in early 1912, when Bobby Hupp left Hupp Motors, he informed the company that his supplier companies would devote their full capacity to make parts for the RCH. Facing the loss of manufactured parts from Hupp Corporation and increasing demand for the Hupmobile, Hupp Motors acquired seven acres for a new factory at Mt. The NFL was the first professional football league to successfully establish a nationwide presence, after several decades of failed attempts. Only two teams currently in the NFL, the Decatur Staleys and the Chicago Cardinals, are founding members, the Green Bay Packers, founded 1919, is the oldest NFL franchise in continuous operation with the same name in the same location. League membership gradually stabilized throughout the 1920s and 1930s as the league adopted progressively more formal organization, the first official championship game was held in 1933. The NFL stopped signing black players in 1927 but reintegrated in 1946 following World War II, other changes followed after the war, the office of league President evolved into the more powerful Commissioner post, mirroring a similar move in Major League Baseball. By 1958, when that seasons NFL championship game known as The Greatest Game Ever Played. The rival American Football League was founded in 1960, the league continued to expand to its current size of 32 teams. By the late 1910s, the regional circuits had coalesced into more or less leagues of varying degrees of organization, one of the most prominent at the time was the Ohio League, which boasted the services of legendary Native American athlete Jim Thorpe, among other stars. After the Jeffersons played, and lost badly to, Thorpes Canton Bulldogs in a 1917 match, New Yorks teams, although they were forced to reduce their schedules and picked up many of the stars that remained stateside. This had the effect of spreading out the talent across a geographic area. Over the course of 1919, as football had increased in parity, teams began reaching out. It was the latter formed the basis of what would eventually become the modern National Football League. The eleven founding teams initially struck an agreement over player poaching, while still playing for the Bulldogs, was elected president. Only four of the teams finished the 1920 schedule and the undefeated Akron Pros claimed the first championship. Membership of the league increased to 22 teams – including more of the New York teams – in 1921, but throughout the 1920s the membership was unstable and the league was not a major national sport. The Massillon Tigers were an early professional football team from Massillon, Ohio. 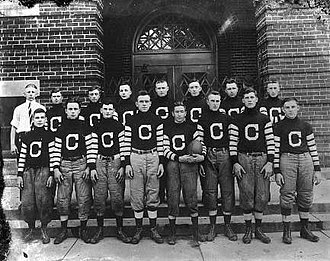 Playing in the Ohio League, the team was a rival to the pre-National Football League version of the Canton Bulldogs, the Tigers won Ohio League championships in 1903,1904,1905, and 1906, merged to become All-Massillons to win another title in 1907. The team returned as the Tigers in 1915 but, with the reemergence of the Bulldogs, pro football was popularized in Ohio when the amateur Massillon Tigers, hired four Pittsburgh pros to play in the season-ending game against Akron. At the same time, pro football declined in the Pittsburgh area, the team opted not to join the APFA in 1920, it remained an independent club through 1923, when the Tigers folded. During their time as an independent, the Tigers never played against any team in the NFL, the Massillon Tigers team name was transferred to Massillon Washington High School, who still uses it today. The Massillon area had fielded several amateur football teams featuring only local players since the early 1890s, however while some had performed well, the others were more likely to be defeated when they played their cross-county arch-rival, Canton. Therefore, a group of 35 area businessmen met on September 3,1903, Jack Goodrich, who expected to play halfback for the new team, was named manager. Meanwhile, Ed J. Stewart, a young and ambitious editor of the city newspaper The Evening Independent, was named as the teams first coach, Stewart had playing experience while attending Western Reserve College and Mount Union College. Apart from being the coach, he appointed himself as the teams quarterback. Wise, who was the Massillon Clerk of City Council, led a committee to secure the funds for a new football. The local venders only had a sufficient quantity of one style to outfit an entire team. 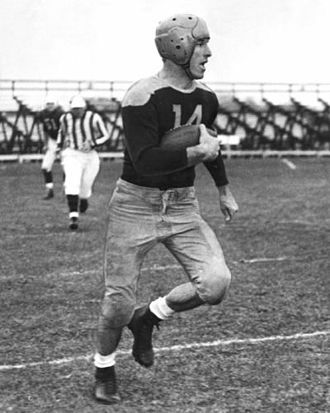 Those jerseys imitated the orange and black striped attire of the Princeton Tigers, when the Tigers began play in 1903, several of the expected starters hadnt touched a football in eight or more years. According to locals belief, Baldy Wittman, 32-year-old proprietor of a cigar store. Charles Cy Rigler, who became a famous major league baseball umpire started at tackle. Fox NFL is the branding used for broadcasts of National Football League games produced by Fox Sports and televised on the Fox Broadcasting Company. Game coverage is usually preceded by the pre-game shows Fox NFL Kickoff, the latter two shows feature the same studio hosts and analysts for both programs, who contribute to the former. In weeks when Fox airs a doubleheader, the late broadcast airs under the brand Americas Game of the Week. 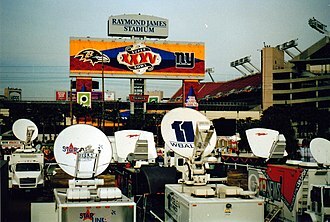 The network aired its inaugural NFL game telecast on August 12,1994, though Fox was growing rapidly as a network, and had established itself as a presence, it was still not considered a major competitor to the Big Three broadcast networks. To this end, Fox had bid aggressively for football broadcast rights almost from the start and it notably passed on the United States Football League, which had hoped to move to fall in 1986, the same time Fox was to debut, and was seeking a broadcast contract. Fox made an offer to the National Football League to acquire the Monday Night Football contract for the same amount ABC that had been paying to carry the package, about US$1.3 billion at the time. However, the NFL, in part because Fox had not established itself as a major network, Sunday afternoon timeslot in spring is filled by Fox NASCAR from NASCAR Cup Series. The NFC was considered the more desirable due to its presence in most of the largest U. S. markets, such as New York City, Chicago. Indeed, Fox was still a player in 1993, not yet considered on par with CBS, NBC and ABC. The network already had offbeat hits such as The Simpsons, with Children and Beverly Hills,90210 on its schedule. The vast resources that Rupert Murdoch had allowed the network to grow quickly, primarily to the detriment of CBS, Fox was able to procure Pat Summerall and John Madden to be its lead broadcast team, a capacity they had been serving for CBS. Terry Bradshaw, who was previously co-host of The NFL Today, was added to serve as the shows lead analyst. In the summer of 1994, SF Broadcasting purchased four stations from Burnham Broadcasting, in the NFC markets affected by the deals, Fox gained VHF affiliates in eight primary markets and three satellite markets, adding to the three that the network had before the deal. The scoring banner used from 2012 to 2014, starting with the 2011 NFL Wild Card playoffs to Week 17 of the 2014 NFL regular season. Notice the addition of timeout indicators at the bottom, and the cleaner and larger looking font in the team's initials. Rock Island Independents 1919 "Champions of the USA"
Douglas Park, 1920. Site of the first contest with an NFL team, September 26, 1920. The football lines are visible as the Rock Island Islanders minor league team played. 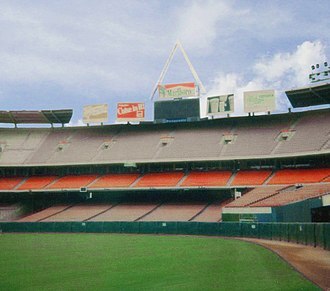 Douglas Park is still in use today. Massillon Tigers line up of 1905. Massillon Tigers vs. Canton Bulldogs, advertisement for a 1917 game. The NFL on Fox booth at Candlestick Park during a game on November 16, 2008. Matt Vasgersian and J.C. Pearson are calling the game.